Yoon Ha Lee’s novel Ninefox Gambit came out from Solaris in 2016 and quickly garnered massive critical acclaim and was short-listed for the Arthur C. Clarke, Hugo and Nebula Awards. It won the Best First Novel Award in the Locus Awards and the Reddit Fantasy Award. His story collection Conservation of Shadows was released by Prime Books in 2013. He lives in Louisiana with his family and an extremely lazy cat, and has not yet been eaten by gators. But this book does feel like a worthy conclusion. So just how many Jedeos are there? And how can everyone who hates each other somehow team up to kill some other side of the family? Or something. I think. The characters definitely drive the plots, and are very much multi layered. And the journey of self discovery that Jedeo endures is both both horrific, yet sublime. The results are incredible as he struggles to overcome a past he doesn’t know about, a present he is not ready for, and a future that seems all too suicidal, again. Some of the better SciFi reading here for sure! I really enjoyed the previous two books in this series – this one is just as good, if not better. I love Yoon Ha Lee’s characters and world-building! The book feels like a very fitting end to the trilogy. I would love to read more stories about Cheris and Jedao in the future. Reading this series has never been facile but it has always been satisfying. 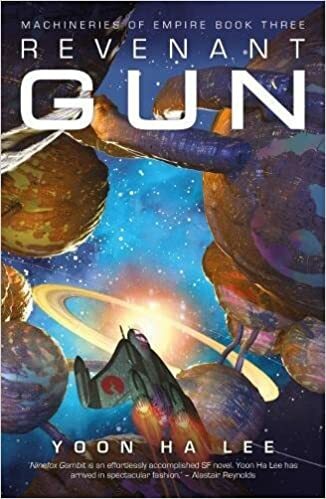 While Ninefox Gambit was an often disorienting immersion experience, the fascinating world in which Jedao awakens in rewarded the reader with a novel of the scope and scale that truly defines the Space Opera genre. If the first Machineries book was Jedao’s and the second, Raven Strategem, was Cheris’s, Revenant Gun belongs to Nirai Hexarch Kujen. We finally learn more about this shadowy, or might I even say shady, character. Prepare yourself. If you had qualms about Jedao, Kujen is the most challenging (repellant?) character in a series in which our shifting paradigms defined the moral ambiguity of the Machineries world. I can firmly say that very reservation that I had about Kel formation instinct, or what happened to Jedao every time he reawakened since his execution, or my thoughts about the relative benefits of calendrical heresy were borne out by this final volume. Lee finally lets us see more of the backstory and the underpinnings of this world. He graciously leaves us at what will merely be the beginning of the latest iteration. Among the many things I’ve enjoyed in this trilogy was the diversity of gender and orientation that was threaded seamlessly, and without labor, in the Machineries universe. We see straight, gay, bi, and ace, and trans/nonbinary characters, all of which reflects the real world we live in. (The sensitivity of language and pronoun usage in this series is terrific, by the way.) The issues of abuse of power, consent, personal will and freedom presented in this book made me better understand some of the dynamics of the first two books. What an amazing finale. While I missed some of the characters from the second book (want. more. Mikodez.) the exploration of Kujen and Jedao, locked into their centuries-long morality play, was fascinating and satisfying. The vast and complex world that Yoon Ha Lee has created will be hard to leave behind. In fact, I am likely to listen to the entire trilogy, all over again, on audiobook shortly. (And the audiobook of Revenant Gun is forthcoming soon?) I hope Lee continues to give us occasional short works from this world. Whether more about Cheris and the Mwennin or once again bannering the deuce of gears in some new adventure, I’d be an eager reader.